Insects have not only adopted the status of pests–and– friends–of–everyone. There are many others that are, in true sense – predatory. 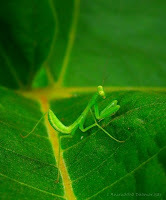 And here I am talking of Mantids, commonly so-called Praying Mantis(es). 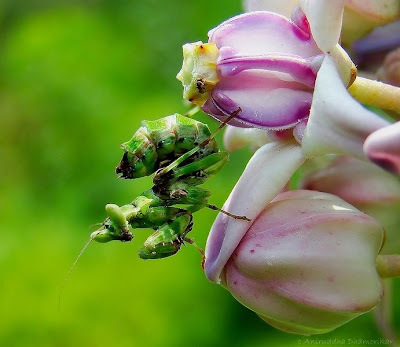 Praying Mantises belong to the order Mantodea. They are referred to as “Praying” Mantis for the design of their forelimbs –or the appendages – rather called raptorial legs, held in a shape as if “praying with folded hands”. These praying limbs aren’t really praying, but preying they are! These raptorial legs are so designed to act like pincers, scissors, crushers and fingers! Mantids (as they are generally called) also have highly developed compound eyes with a wide binocular vision. 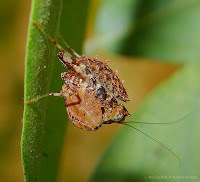 The head is triangular which can rotate to about 300 degrees in some species and they also have elongated thorax that aids in free movement of the raptorial limbs. Besides this built-to-kill morphology, they are also excellently camouflaged. They can mimic a stick to a leaf, a flower to stones, ants (especially newly hatched nymphs) and even a fire ravaged landscape! The mimicry is of prime importance in the Mantid world, for they are ambush hunters. They prefer keeping dead still – and being well camouflaged – they go unnoticed by an unsuspecting prey – which, when close – is captured with blinding speed. Some Mantids such as Bark Mantis and Ground Mantis however, often prefer stalking prey. The Mantids have not only mastered the art of hiding, they are the Jack of all trades! 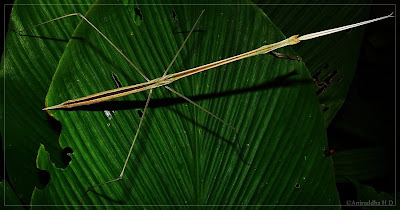 Mantids not only camouflage and remain still; they also mimic the movements of leaves or branches swinging in air. They rock and roll as per the leaves – to match that exact shape and action. This has given them a heightened chance of finding prey. Mantids are large insects, often growing to about 100mm when adult, and some grow really large and are capable of eating small lizards, frogs, birds and even snakes! Although on the other hand, if they (all the vertebrates that are capable of eating a Mantid and capable of being eaten by one!) can consume Mantids with a smile on their face! 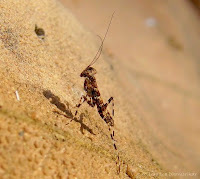 This is a fact, Mantids, although excellently camouflaged and mimics – are not protected chemically (toxin, venom is absent) which makes them vulnerable to be eaten by other predators. Thus it is clear that Mantids are such masters of disguise not only to hunt but to hide from being hunt too! 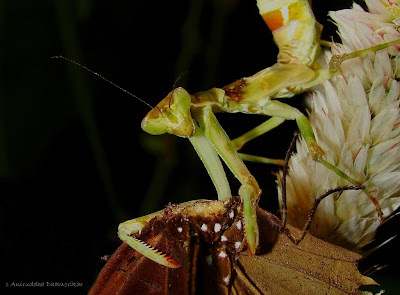 Mantises defend themselves with courage, and attitude! 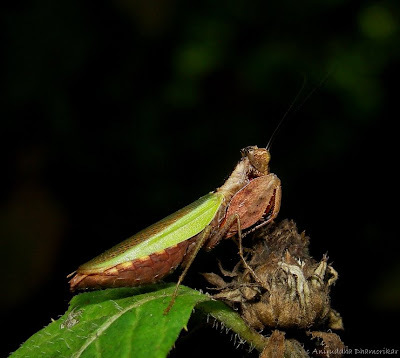 Mantids also have “defensive” postures (common of all is spreading of the raptorial legs and opening the wings to show a “threat display”) and striking colors and shapes like large eyes (to disorient the predator) in their hind-wings. This may deter the prey and a Mantid may live for another day! Mantids are a group of insects which thrived and diversified recently (as recently as 65 – 1.8 million years ago!) much after their cousins Cockroaches and the Termites. Cockroaches indeed for Mantids and cockroaches both shared a common ancestor way back in Cretaceous Period (145.5 – 65.5 million years ago), the closest relative (now) being a cockroach with fore-limbs similar to the raptorial legs of Mantids - Raphidiomimula burmitica (no picture available). 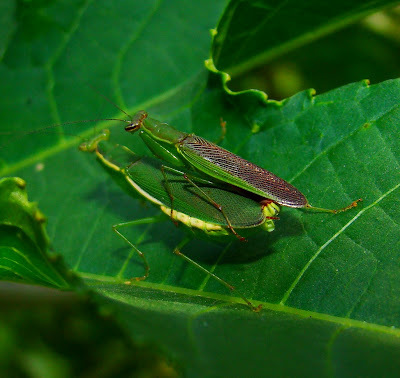 Mantids also show an interesting behavior while mating which has been of interest for many entomologists to study. Mantids show, what is technically called “Sexual Cannibalism” where the female Mantis eats the male mantis after mating. The female usually eats off the head first, often even before mating! This mating behavior is much debated, where some say that as soon as after mating, the female consumes the male to gain nutrition easily, while some consider this to be an indication that male submissiveness does not inherently increase male reproductive success, rather that more fit males are likely to approach a female with caution and escape! These two contrasting theories still boggle the minds of the experts. Research by Liske and Davis (1987) and others found (e.g. using video recorders in vacant rooms) that Chinese mantises that had been fed ad libitum* (so were not starving) actually displayed elaborate courtship behavior when left undisturbed. The male engages the female in courtship dance, to change her interest from feeding to mating. Courtship display has also been observed in other species, but it does not hold for all mantises. * Ad libitum is used in biology to refer to the "free-feeding" weight of an animal, as opposed, for example, to the weight after a restricted diet. In nutritional studies, this phrase denotes providing an animal free access to feed or water thereby allowing the animal to self-regulate intake according to its biological needs. Mantids lay a hundred eggs in a sac called “Ootheca”. 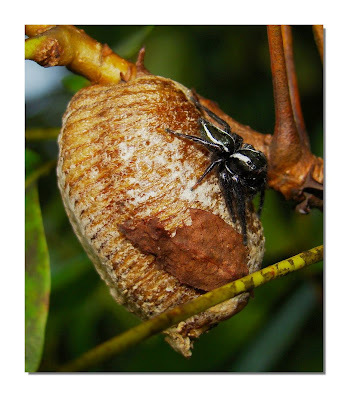 The ootheca is generally laid during monsoon, post-monsoon and pre-summer. 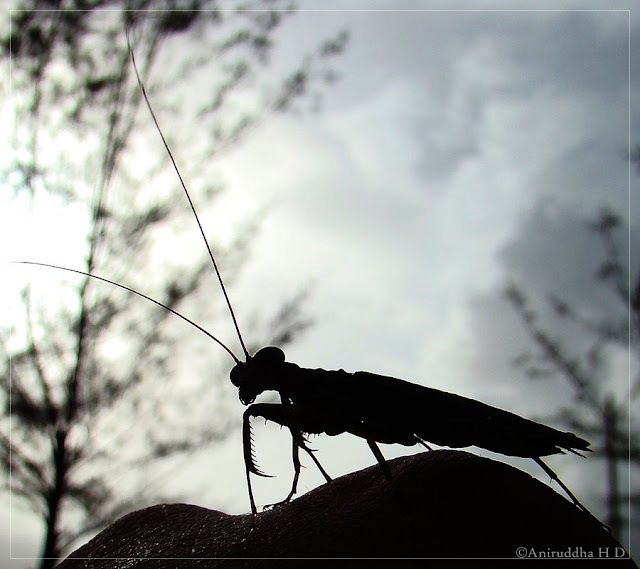 A lot many mantises are seen during post-monsoon – probably due to abundance in prey during that period. The nymphs are imago of the adults, but lack wings and reproductive glands, some nymphs also mimic ants. They feed on a variety of insects such as butterflies (even the unpalatable ones! ), beetles, bugs and ones that are considered pests too! 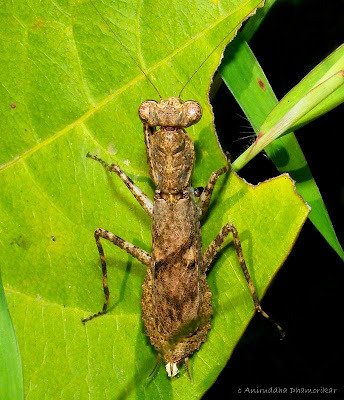 Mantises are and remain hidden from the eyes of prey and science. They are the true masters of disguise. 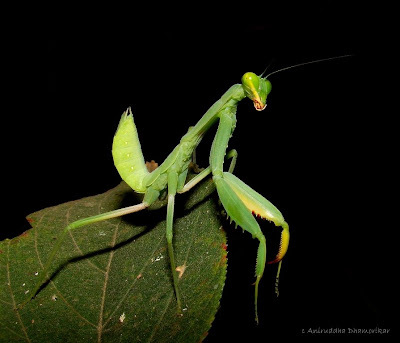 Although the common name “Praying Mantis” sound cool, to go to the species level identification of a particular Mantid is impossible – and only an entomologist may ascertain that with a certain skill. A stick-mimicking mantis around 20 cm long! The Mantids of India require a revision, which is of course, taken under by many eminent scientists. This will not only make us understand our neighbors, with whom we share our backyard but also make us careful enough not to kill them! Your mantids are just super...would love to see a pic of the pseudoscorpion! Very interesting post indeed. 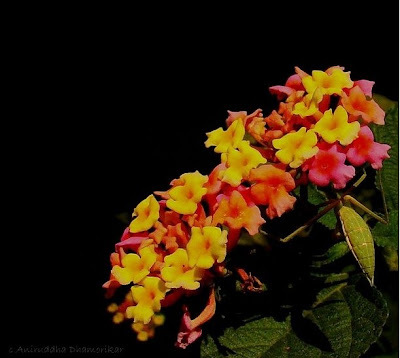 Love your images. Do you know the name of round brown mantis (image #7? Actually I posted this mantis for identification on site" what's that bug", but they declared it is unknown species. Any help will be highly appreciated. Pardon my late reply. 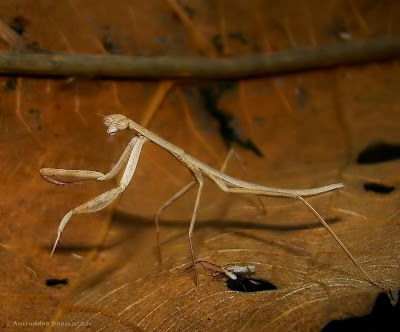 The brown mantis is a nymph, hence going down to species-level of classification is very difficult.